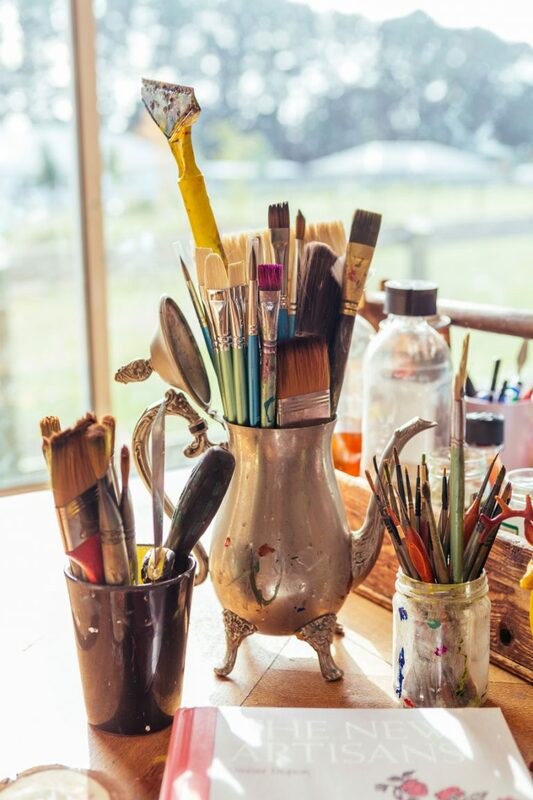 Artists’ studios inevitably reflect their work ethic and passion, and over the past year or so, we’ve been lucky enough to see inside a few of our artists’ own personal work spaces. 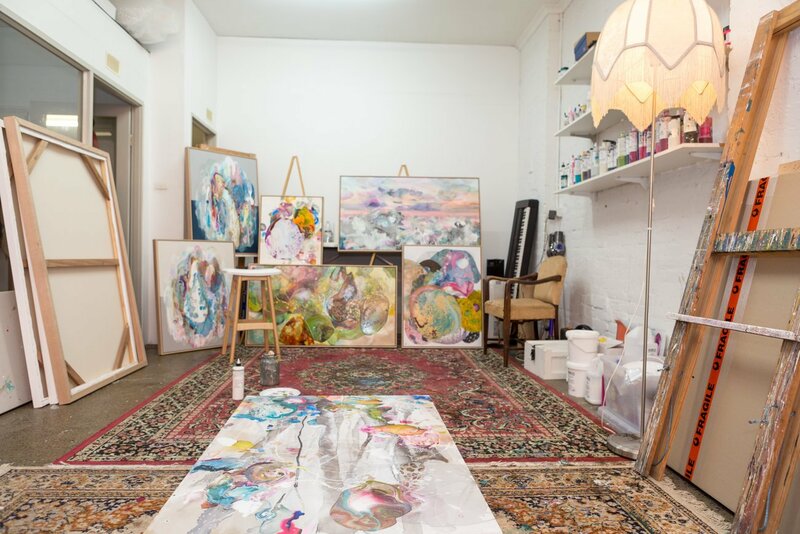 It’s always a pleasure to see where the magic happens, so below, we’re revisiting a few of our favourite artist studios. 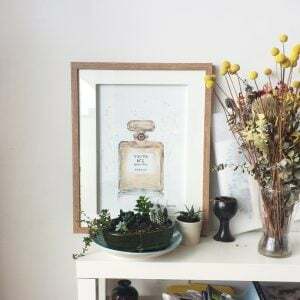 Daniella Germain creates tiny watercolour pieces from her tiny backyard studio, which was custom built by her partner to sit among the garden of their suburban home. 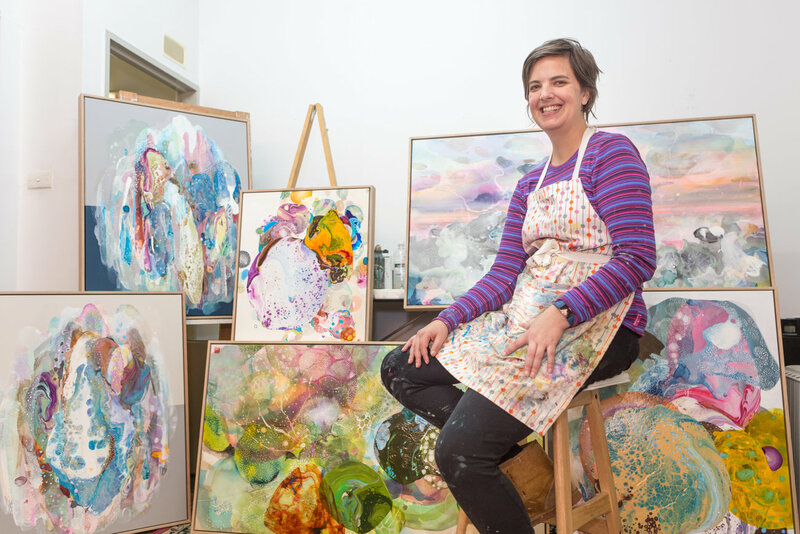 In Daniella’s own words, “I’m small, my studio is small, my works are small.” Despite its size, the self-contained space has room enough for Daniella to paint, use her computer and even display a few treasured belongings. Her dogs seem to like it too! 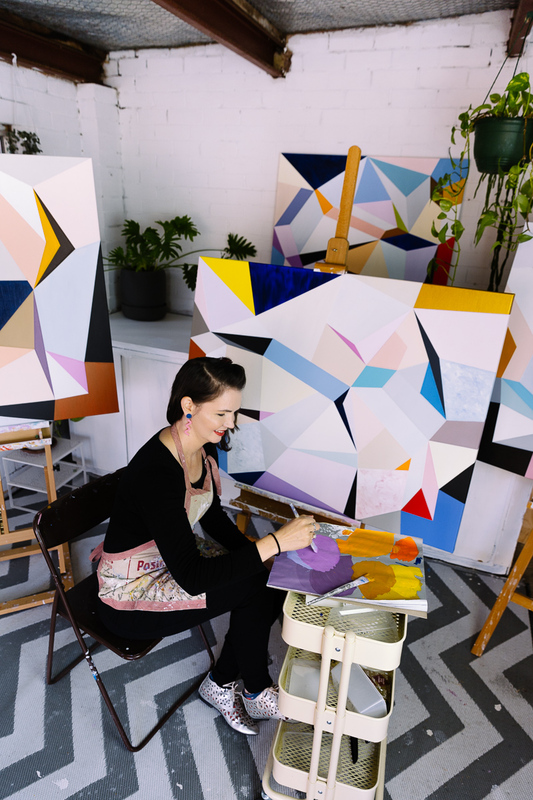 Click here to read more about Daniella’s studio and art practice. 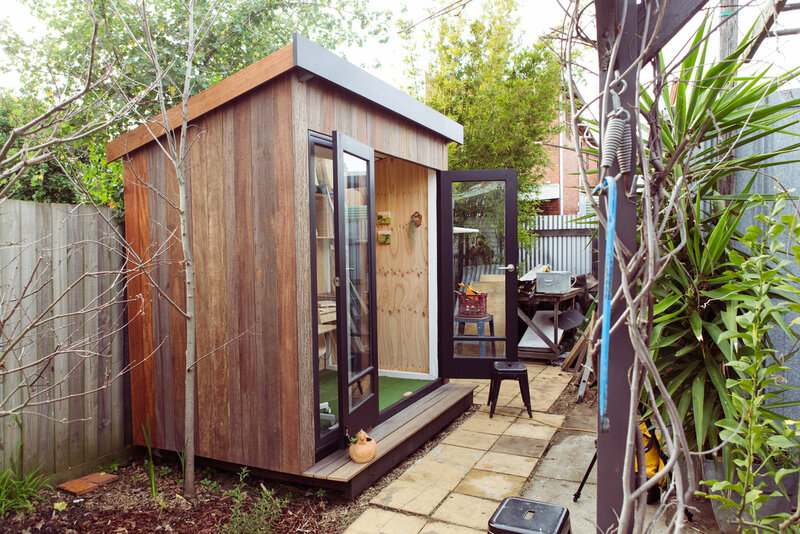 Daniella’s studio seems right at home among her Melbourne backyard. Daniella’s dogs are always ready to offer encouragement! Susie Monte’s studio is proof that even the most utilitarian of spaces can provide peace and tranquility. 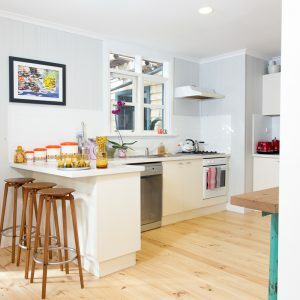 She’s taken advantage of the natural light streaming into the garage by whitewashing its brick walls and adding a cosy heater, some handy storage and a few happy plants. 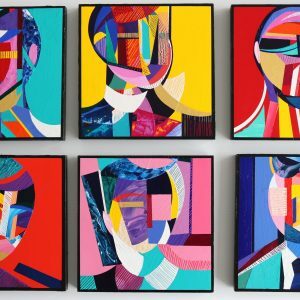 Her bright, bold art is really the finishing touch, and many of her pieces are also on display throughout the rest of her home. Susie hard at work in her charming, light-filled studio. 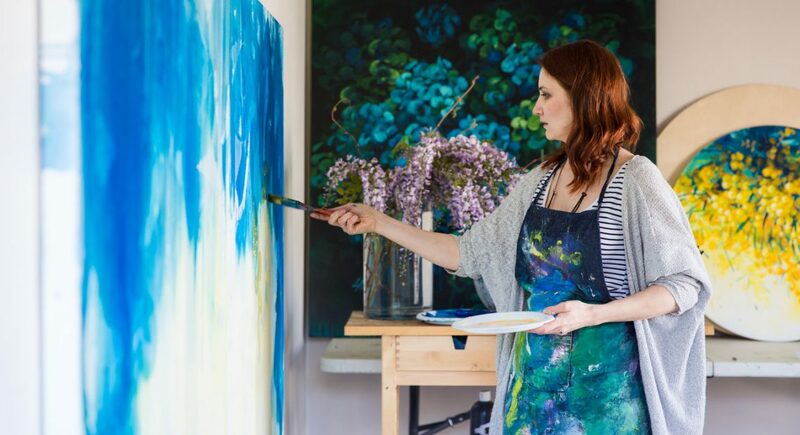 Susie’s art is really the finishing touch in this beautiful studio. 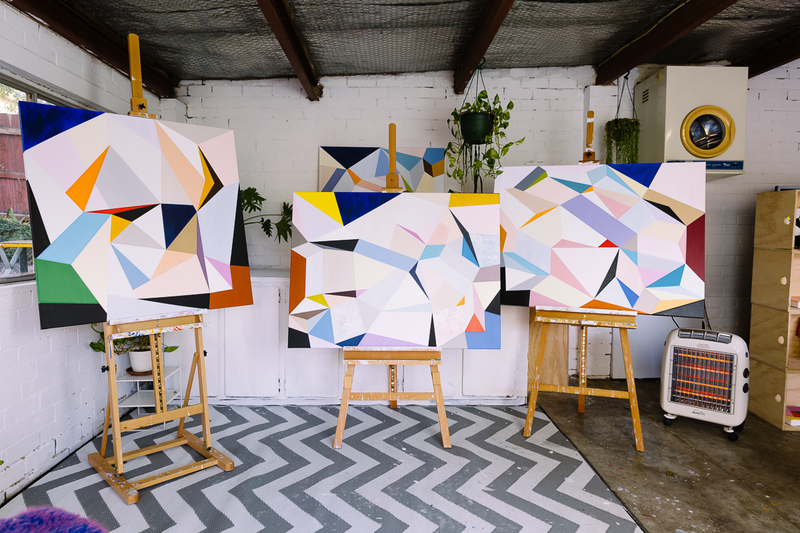 Lily Nova paints her glorious floral still-lifes at her sunny Melbourne home. The large work table is an important feature of the room, as it’s perfect for arranging the Australian natives that she gathers (with permission) from her neighbours’ gardens. 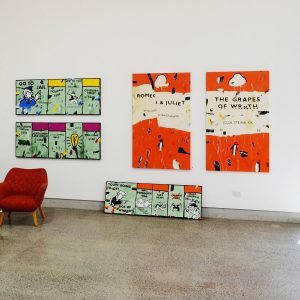 “Australia is blossoming all year round,” says Lily. 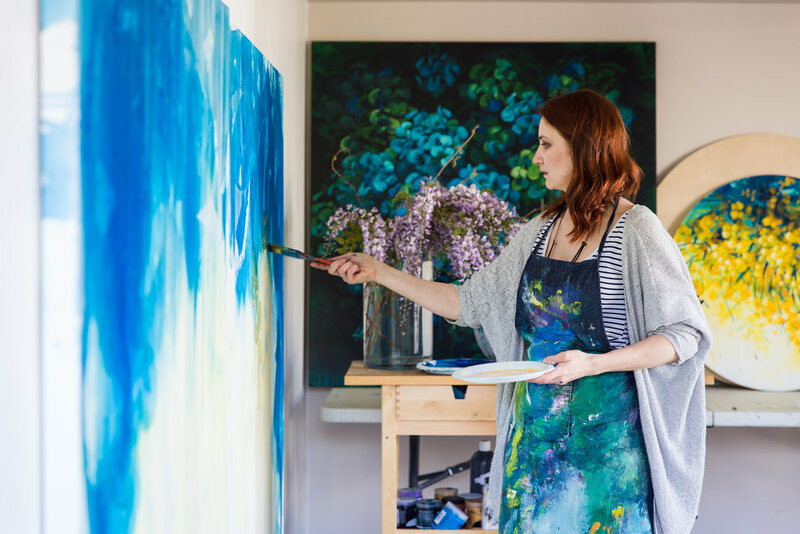 “It’s like music for my heart to see all this beauty and I just try to put it on a canvas.” Click here to read more about Lily’s artistic journey and see her studio a little better. Sourcing stunning blooms like these ones has been a great way for Lily to get to know her neighbours. Lily hard at work turning flowers into art. 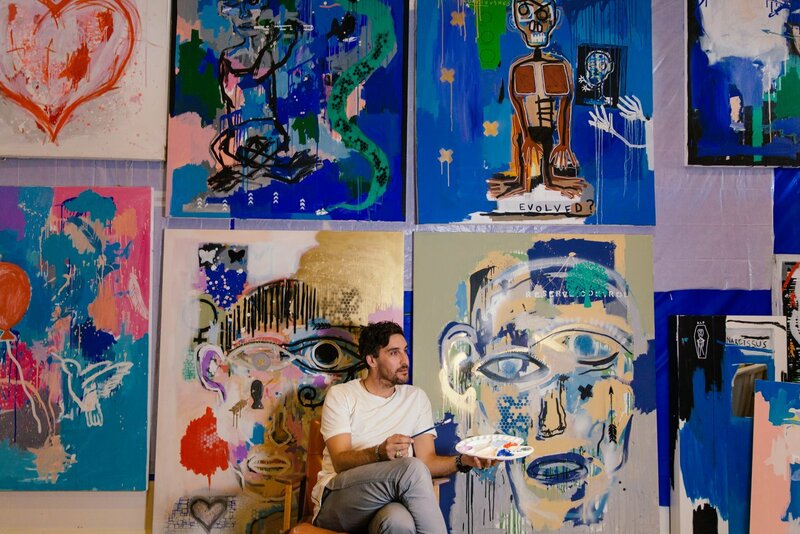 Contemporary abstract artist Cameron Holmes first picked up a paintbrush in his adult years, and hasn’t looked back since – its a commitment that manifests itself physically, by the sheer amount of space dedicated within his home to his ever evolving artwork. 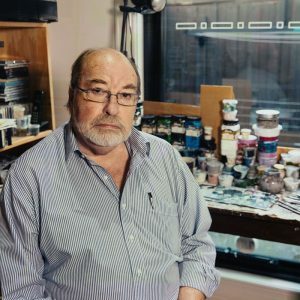 Each piece can take Cameron many months to complete; when he is undertaking a series, he’ll often be working on several pieces at the same time, saying, “it really helps bring it all together and to be working on them all at once.” The results are stunning. 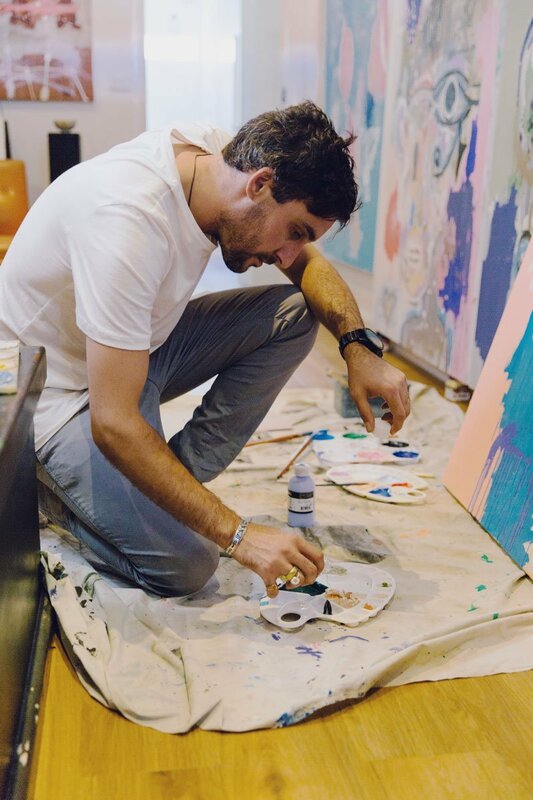 Click here to see Cameron at work and hear more about his artistic journey. 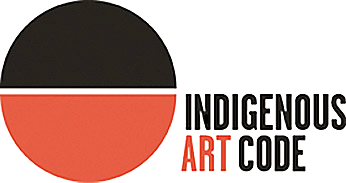 Cameron uses the personal discipline that he acquired as an athlete for his artistic practice, treating his studio as he would the gym. It takes a lot of wall space to display Cameron’s latest projects! 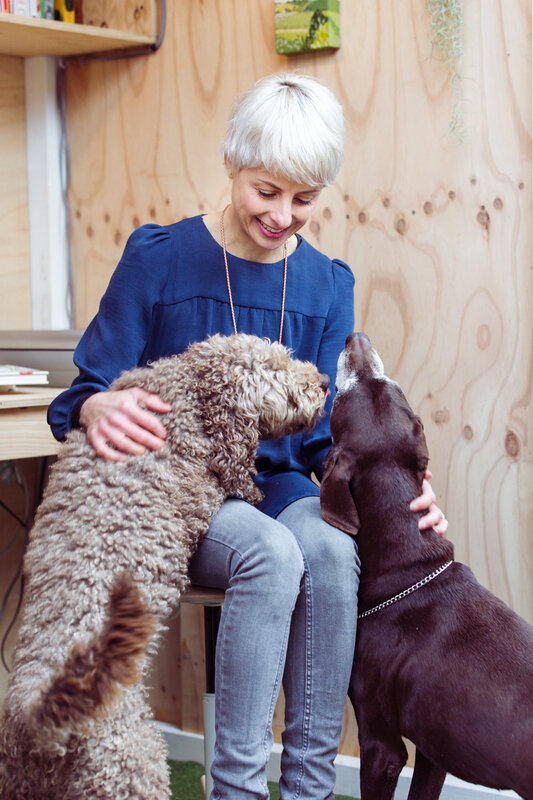 Amanda Krantz lives and breathes creativity, having organised her home entirely around her art practice. 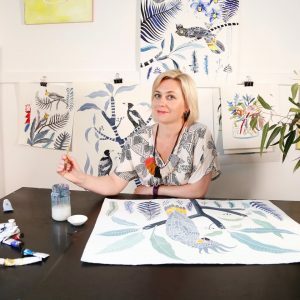 The large room where Amanda works is nice and cosy, filled with ornate Turkish rugs, art supplies and even a keyboard to keep the ideas flowing. 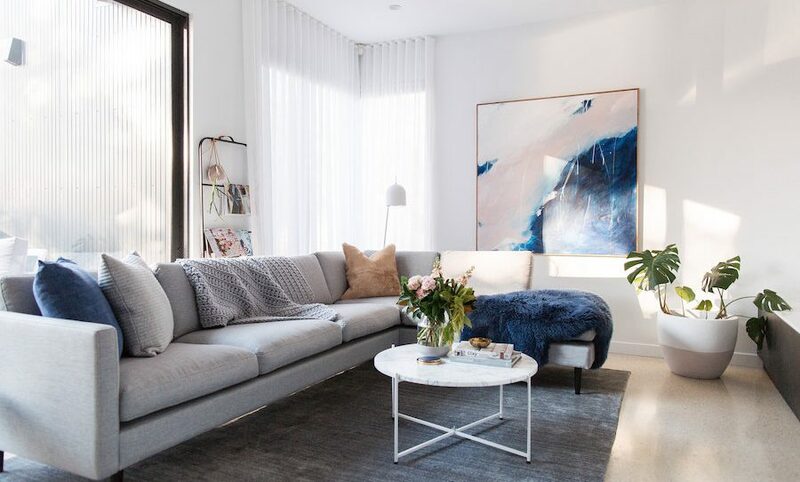 Living spaces such as Amanda’s bedroom and kitchen (not visible in the pictures below) take second priority to the studio, at least in their size, and anyone who enters the house really gets a sense of Amanda’s work ethic and passion. Amanda sometimes works on the floor to get the best purchase on her artwork, so the rugs are an essential feature of the room. Amanda perched among the products of her labour! 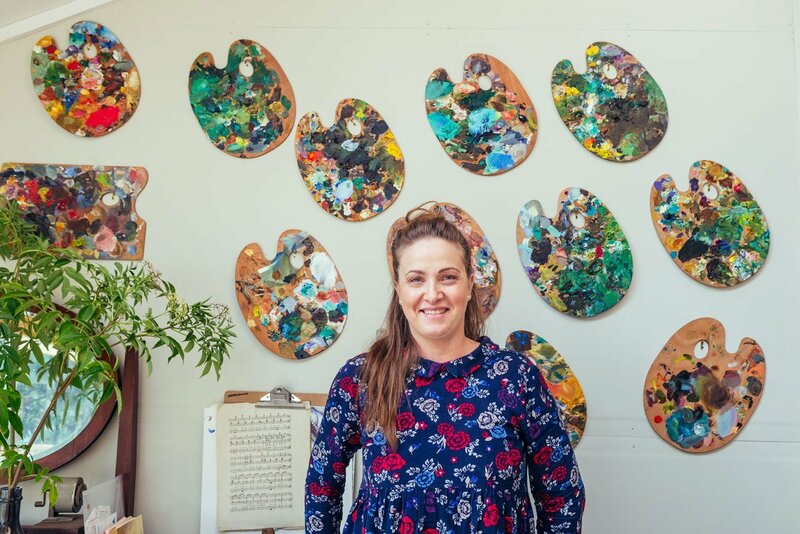 Llael McDonald’s studio is a delightful home away from home that she shares with another artist, nestled in amongst central Victoria’s Wombat State Forest. It’s filled with small, vintage treasures and creature comforts to ensure a comfortable working environment. Llael often draws upon the nature just outside her doorstep for inspiration to use in her pieces, and also adds in her own imaginative elements from fables and fairytales. Most importantly, the studio also has excellent natural light. 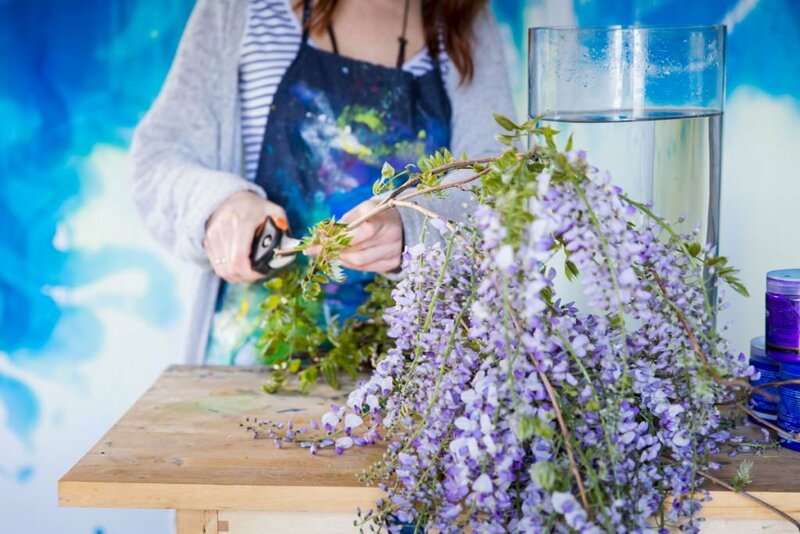 Click here for more sneak peeks into Llael’s lovely studio. Llael celebrates her old paint palettes by hanging them up on the wall. Small details like these give the studio an overall feeling of homeyness. Click here to see more. Professional-quality acrylic paint on staple-free, stretched cotton duck canvas. Framed in hand-made Victorian Ash floating box frame. Signed on the back.